The Prime Minister has announced his plan to provide a National Schools Award Scheme to promote more cycling and walking to school. This will be funded by the cycle industry through its Bike Hub levy, and the project will be led by the Bicycle Association with the Department for Transport. The Prime Minister’s initiative will bring together a number of national organisations which already have wide experience of working with schools in cycle training, walking projects, and in programmes to encourage behaviour change in travelling to school. The aim will be to capitalise on, and enhance, existing schemes, such as the “Big Pedal” and Cycling Scotland’s “Cycling Friendly Schools”, as well as Walk to School Week, to generate a new national momentum for cycling and walking to school through the leadership of the Prime Minister. The Schools Award Scheme is intended to provide a lasting and practical legacy for everyday cycling inspired by the UK’s cycling success at the 2012 Olympics. 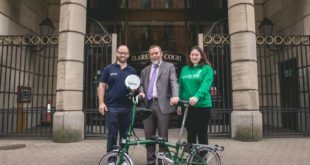 Phillip Darnton, executive director of the Bicycle Association, told BikeBiz that the details of the programme have yet to be finalised: "We are very pleased to be working with the DfT to develop the scheme; as yet we have not settled any of the details. We are planning to work with TfL, Cycling Scotland (who run a cycle-friendly schools scheme already), with Living Streets (who have a walk to school week) and, of course, with Sustrans who already run the Big Pedal with funding from Bike Hub. We are also engaging with the Youth Sports Trust, the Association of Bikeability Schemes (cycling instructors nationally) and other organisations such as the CTC to design a scheme which will appeal to as many schools as possible up and down the country." In case you missed the announcement earlier this week, the Secretary of State for Transport also revealed that funding for Bikeability, the National Standard Cycle Training programme, would continue at least until 2016. This is a key component in training children to ride confidently and safely. About 50 per cent of young people expressing the wish to cycle to school – and with most schools being within walking or easy cycling distance – the National Schools Award Scheme will provide a new incentive to revive the cycling habit, with an immediate impact on children’s health and wellbeing, as well as a reduction in congestion and pollution from the school run. On behalf of the cycle industry, the Bicycle Association is committed to help deliver the Prime Ministers ambition for cycling.